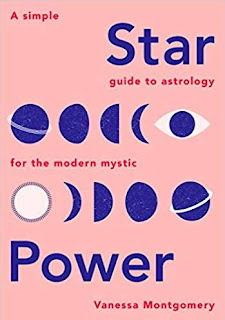 Today I'm reviewing Star Power: A Simple Guide to Astrology for the Modern Mystic by Vanessa Montgomery. Disclaimer: I am going to preface this review with the following statement. I do not practice Wicca. I am not a priestess nor do I claim any religious affiliation. I identify as an atheist witch and my review of any pagan/witchcraft books is presented from this point of view. As always I'll start with the physical attributes of the book. This book is solid. It is not as tall as some of the books I have reviewed but it is substantial. 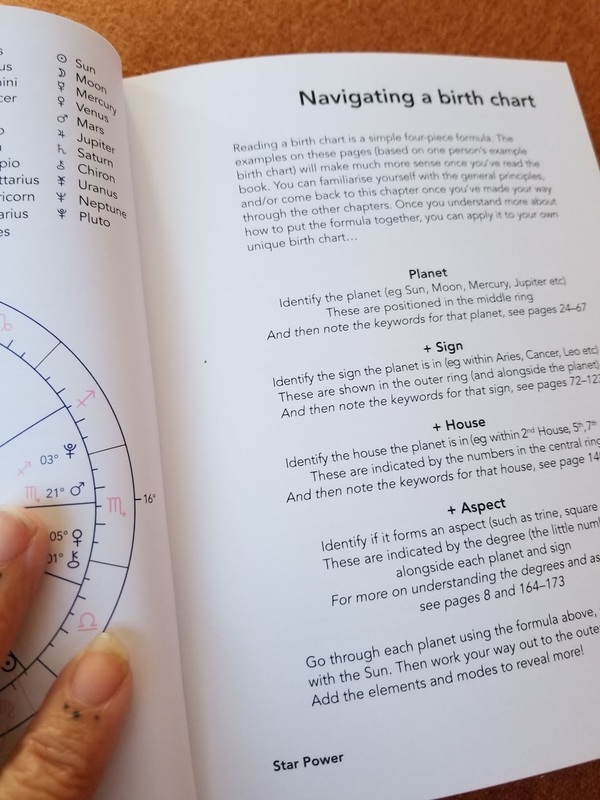 The front and back cover offer tables with the planets, signs and elements. There is no index in this book but there is a page of suggested reading. The images in the book are limited to clip art and some basic line drawings. If you're looking for a book that will tell your sign what to do with an investment I would recommend you select a different book. If you're looking for instruction on how to fully understand a star chart, this is your book. This book starts with a brief history of astrology. And when I say brief, I mean brief. Only one - two pages are dedicated to this. The book also includes a section on the language of astrology. This section is very useful. Time after time I see books that are this directed towards a specific topic, that they forget that someone may be picking up this book for the first time. While I appreciate the advanced studies in many of the pieces I have reviewed to this point, I feel a special connection to those authors who take the time to bring their reader up to speed. Be it with an introduction, a preface or including this type of glossary as a chapter as part of the book. As someone who excelled in vocabulary, I believe that understanding the exact definition of the word the author is using helps me insure that I am on the same page and able to learn as much as I can from the text. 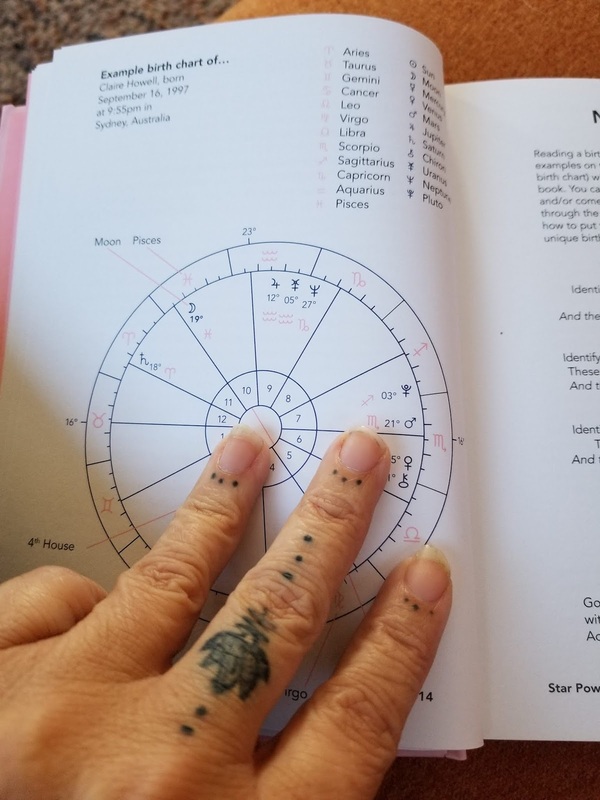 I enjoyed the section on unlocking your birth chart (page 12) this section goes into detail about what they are, and how to use them. It contains great images of star charts and offers detailed instructions on learning to read them. The first step however is obtaining your star chart. I have found several websites that offer free star charts and there is a plethora of software out there that you can buy to help you create your own. Each section of this book builds on the previous, there are no quick references here. I have found that this is something you just need to sit down and read to be able to fully understand your own chart. Overall I found this book extremely informative and full of the complete details you need to decipher a star chart. I think that this book will benefit the learned reader but does offer some interest for the beginner. The author guides us through the art of learning to read our own charts and will perhaps open up a interest in reading for others. An excellent guide and I highly recommend.